This is the famous 1563 painting by Pieter Bruegel (1530-69). This image is from CT 11 Jan 1999 p66, which gives credit to Erich Lessing/Art Resource. According to Usscher, Babel was built 2242 BC, which would be Peleg's generation (15 from Adam, Peleg 5yo, see Gen 11). "Noah's descendants spoke 1 language (Gen 11:1, Hebrew?). They journeyed SE from Ararat (Urartu, Armenia) to the garden spot of the very fertile alluvial plain of Babylonia (Shinar), between the Tigris and the Euphrates about the last 200 miles of their course before they enter the sea. The rich silt of these 2 great rivers built up this ideal location for the cradle of postdiluvian civilization and the Babel builders (v2). After a long period of sedentary occupation in S Babylonia, and during the life span of Eber's son Peleg (Gen 10:25), which apparently occurred well before 4000 BC [hmmm, acc. to Ussher, Flood was 2349 BC, Tower of Babel was 107yrs later in 2242], the human race had multiplied sufficiently and developed arts and crafts to build a city and 'a tower that reaches to the heavens.' This is not mere hyperbole, but an expression of of pride ('make a name for ourselves') and rebellion against God and His explicit command to 'fill the earth' (Gen 9:1). Self-glory, instead of God's glory, and man-made unity to replace the unity forfeited by abandoning the fear of God were evidenced. Brick (sun-dried clay) and mortar (bitumen) were ready made materials in the alluvial soil of the plain (v3). "Babylon was undoubtedly one of the most polyglot cities in the ancient world, and the localization of the beginning of human languages there was effective. The confusion of languages was a divine judgment upon the pride and rebellion of the Babel-builders and effected their dissemination over the earth. But it was a divine act, and the precise way it was accomplished is not revealed. Gen 10 explaining the diversity of races [Table of Nations] is much later than the events of 11:1-9. 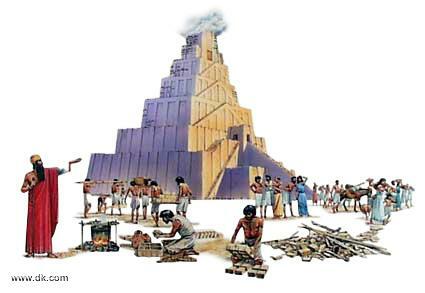 "The Tower of Babel is illuminated by the gigantic artificial mountains of sun-dried bricks in S Babylonia called ziggurats (Assyrian-Babylonian word ziqquratu, meaning 'pinnacle' or 'mountain top'). 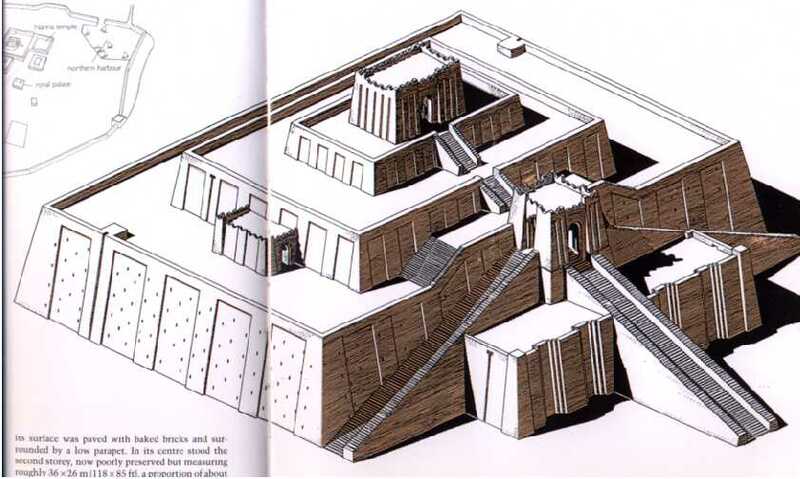 The oldest recovered ziggurat (1 of >24 known today) is at ancient Uruk (Erech, Gen 10:10, modern Warka). 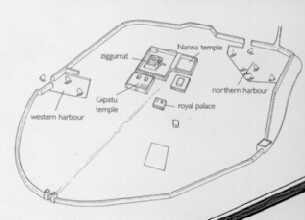 It was a vast pile of clay buttressed on the exterior with brick and asphalt (bitumen), like similar ziggurats at Borsippa, Ur and Babylon. Built in stages, 3-7 stories high, they were varicolored. On the topmost stage, the shrine and image of the city's patron deity were housed ... The polytheistic use of later towers, copies of the original, exemplified a complete apostasy into idolatry so characteristic of the Sumerians and the later Semitic Babylonians of the plain of Shinar" (Unger pp43-4). Hmmm, they claim the genealogies must be abbreviated, since 1) the gap "is much too brief for known contemporary history of Egypt and Babylonia. 2) There is no evidence of a worldwide flood in excavated sites before at least 4500 or 5000 BC and to place the deluge at c2348 BC is archaeologically untenable. 3) Symmetry and abbreviation are characteristics of biblical genealogies [so THEY say]. 4) The apparent intent of the narrative is to trace the messianic line w/representative names" (Unger p43, hmmm). From Strobe Talbott's The Great Experiment (p81): Bruegel lived during Alva's brutal treatment of The Netherlands under HRE Charles V. He hoped humanist methods of science, culture and debate eventually replace "the sword, ax, rack, stake" (81). "Like Dante 250yrs earlier [w/Paradise, Purgatory, Hell], Bruegel found, in the tale of Babel, a coded way of commenting on the politics of his own time ... [He] surely meant the viewer to see that this grandiose project is certain to fail, largely because of its grandiosity ... [the] Tower is surely the House of Hapsburg ... Like the original in Genesis, it stands not for the dream of a unified world but for the reality of an imperial edifice that looms oppressively over the political landscape of the era and that is - again, like the one in Babel - destined for destruction" (81-3). 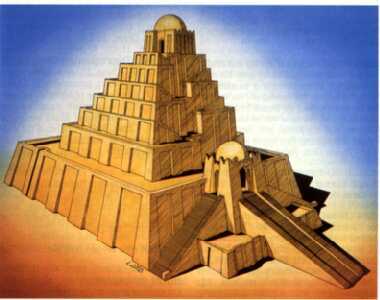 "A ziggurat in Ur from the time of Abraham was discovered by archaeologist C L Wooley. It is a pyramid-like structure, not as imposing as the Egyptian pyramids, but, at 3 stories in height, still impressive" (The Jesus Way, Eugene Peterson, p49). - Unger = The New Unger's Bible Handbook, Merrill F. Unger, revised by Gary N. Larson, 1966/84, Moody, 720pp, SBC. - KBAW = The Kingfisher Book of The Ancient World: From the Ice Age to the Fall of Rome, Hazel Mary Martell, 1995, 160pp, FHL. - HIBD = Holman Illustrated Bible Dictionary, illust. Bill Latta, 2003, own. - 70W = The 70 Wonders of the Ancient World, ed. Chris Scarre, Thames & Hudson, 1999, 304pp, Mustang/FHL.